The Hunger Games: Mockingjay Part 2 is the 4th and final movie in the Hunger Games movie series, which is based on the second half of the third book of the written trilogy by Suzanne Collins, and was released by Lionsgate Films in November 2015. Twelve districts are ruled over by the capital of PanAm. In continued punishment for a rebellion 75 years ago, the capital rules over the districts oppressively, including forcing children from each community to participate in annual Hunger Games–tournaments to the death both for the entertainment of the capital and to send messages about rebellions. 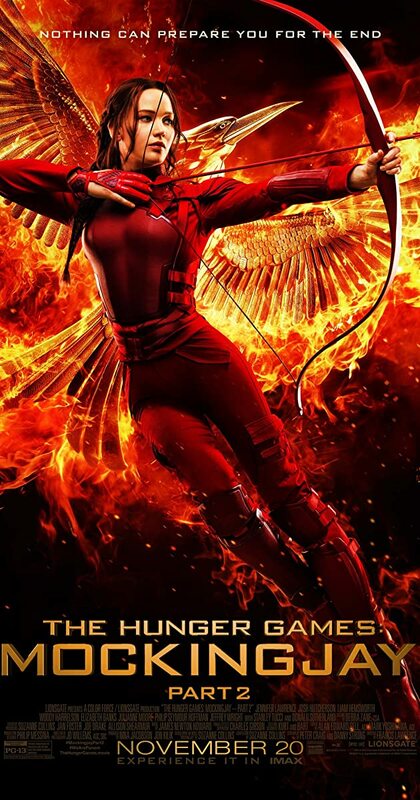 Inspired by the rebellious actions of Katniss Everdeen of District Twelve, and from their new stronghold in District Thirteen that was previously thought destroyed by almost everyone, the districts are in open conflict with the capital for the first time in 75 years. The Ray Bradbury Award for Outstanding Dramatic Presentation is not technically a Nebula award, but it is announced with, nominated with, and voted with the Nebula awards by the same group of people. These last few years I haven’t made it to a lot of movies in theaters, and I feel sad when I hear about a great SF movie that I never got around to seeing. So this year I’ve used the Ray Bradbury award as a brief guide to what SF movies I really should catch up on from the previous year.